Travel Link-Up: Holidays Are Coming! Our Christmas tree went up this weekend. And by "went up", I mean poor John carried the 6-footer himself from the local garden centre while I croak-instructed him over the phone in my sickbed to, "Get something taller than me." All romantic notions of us carrying it together in netting while snow fell gently through the night, pausing under a street-lamp for a kiss while sleigh bells chimed softly in the background were dashed by this awful hacking cough I developed last week, which meant I was too exhausted to manage even the 5-minute walk to pick it out! Last week, I splurged on this gorgeous Christmas tree skirt from John Lewis (I'd link to it but I think it's sold out! ), which is trimmed with bells and red velvet. I kind of love it - and I'm excited that it'll be a part of our Christmas box for years to come. We had a party on Saturday for our family and friends: a celebration of my birthday (which was last week), our new(ish) house and, of course, Christmas. John was on mulled wine duty while I made canapes and heated up the mince pies. It felt so festive and fun! Usually at this time of year, I'm travelling back to the US to spend Christmas with my family in Washington State. I have a familiar routine of getting to Heathrow Terminal 5 early, picking up last-minute gifts in the Fortnum & Mason, Harrods and Jo Malone concessions before carefully tucking my purchases in the overhead compartment on the plane, falling asleep, and waking up to the announcement that we've landed at SeaTac International Airport. This year? It's my family's turn to get on the plane and come to London. They'll be landing at Heathrow Terminal 5 and I'll be greeting them in Arrivals. I can't quite believe it's happening! We're going to Paris and Bruges before arriving back in London to celebrate Christmas at our house. I've just asked my mom to bring our stockings so I can have a bit of "home" in our new home. What about you? How do you celebrate (or not celebrate) Christmas? I'd love to hear! 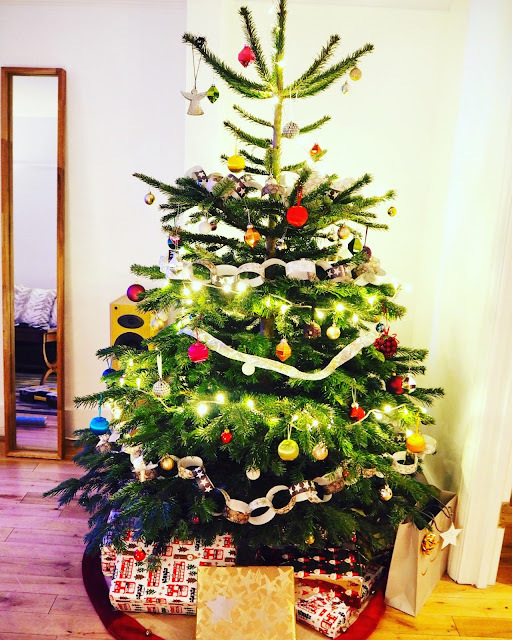 This month's travel link-up is all about celebrating the festive season and is hosted by Rebecca, Emma, Kelly, and Ayla. Head over to their blogs to read more posts about our current favorite subject: Christmas. Ah I'm usually such a scrooge up until about 20th December but this year I seem to be embracing everything early! Your Christmas this year sounds perfect - I won't be leaving Essex! But it'll be nice to do the normal traditions. Which is always such a small affair! Just 5 people but means there's extra cheese! Awww that's so exciting that your family is coming to you!!! <3 <3 Have the most fun! How exciting to have your family coming to London!! They've never been on this side of the pond for Christmas, so it should be interesting, Angie! Thank you, Jessi! I am really looking forward to arrival and to visiting Bruges for the first time! Thank you, Charlotte! Isn't the London wrapping paper cute? The buses say "Angel Puddington" hahahaha!!! John, you are a Christmas legend! I love that tree skirt - it's something we definitely need! Your holiday plans sound great :D (Your tree is beauteous) And HAPPEEEEEE (belated) BIRFDAAAEEE! I bet it was glorious. I hope you get well soon, and have an awesome time with your family! THANK YOU!!!!! I still have a rattling cough but I am getting there! what are your plans for the holidays? Are you going back to the US? You poor thing getting sick! Ohh how exciting that you family are coming to you this year; it's so exciting when they come to visit you and see all the quirky traditions that the Brits have. How fun your family is coming! I had my mom here last christmas and it was amazing. Can't seem to get my dad on a plane and they only have to come from new york! Have so much fun, and I'm jelly of your tree skirt, I'm forever looking for one, will have to just buck up and get one online. One More Sleep ... And A Beautiful Wreath!